Purchased a set of these a few days ago & awaiting delivery. I had a copy of the STL for the Opium Duck that was given a way previously, but unfortunately, of course, I somehow managed to misplace it. I'm planning on electroplating the head's prior to weathering them. I will try to post images the process is successful. Wish me luck. good luck mate,would like to see how this is done.i've got the opium duck off shapeways myself but haven't done anything with it yet. 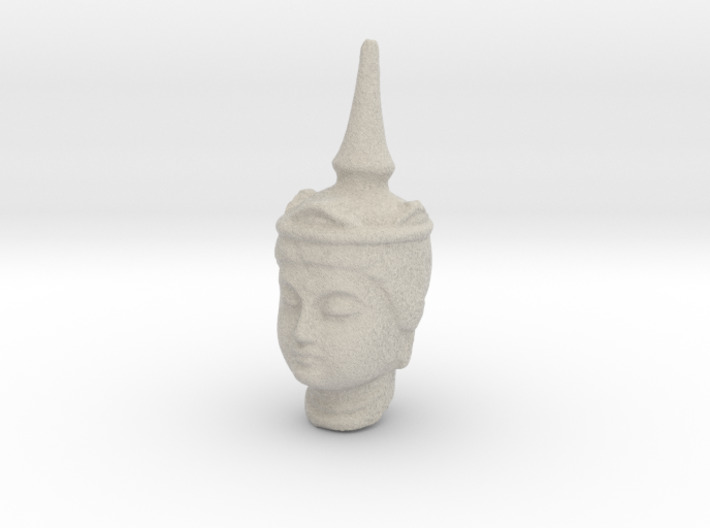 thresh keller have you seen the post in the prop shop "buddha heads for sale" by buch.might give you some ideas. Yes, they are GORGEOUS! And and absolute steal at $60/pair since the 3D prints cost approx +$120 and are raw PLA or ABS. The finish work on those I believe was achieved with paint, right? I will be attempting to match that aesthetic using those pics and screen caps as reference. Hopefully, I can achieve a similar look after electroplating using reactive agents that cause the metal to take on different color patinas. I have all of the chemicals already from electroforming jewelry. IF it doesnt work, I'll atlease have a set of metal plated heads that I can paint and weather. I purchased a genuine antique bronze Hintha Bird Opium weight as well to have on hand as physical reference on hand in order to study. It's a fairly close to the one seen on Rick's piano, but only when viewed from the opposite side that can be seen on screen. The other side is slightly off. It's close but clearly not exact. 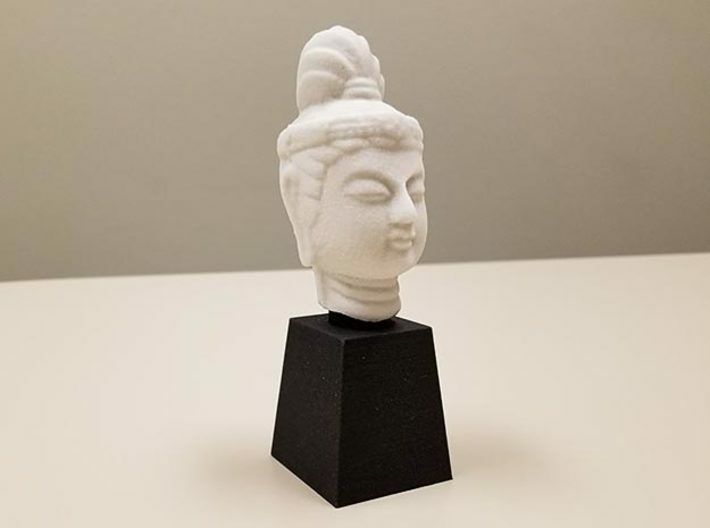 I had hoped to be able to 3D print the Buddah heads at home on my own machine in order to avoid having to wait for Shapeways to produce them, but I didn't see the option to purchase the STL files for the heads. Which I *completely* understand. They deserve to be compensated for their incredible work. However, I've ordered from Shapeways in the past & it can take varying amounts of time before you receive your order. Can be either several days or weeks. I am not entirely clear on how their site works or who ultimately prints what you end up receiving... whether its the seller or shapeways. I'm starting printing Deckard's 2049 optical viewer in the meantime while I weait for the heads to arrive. Quick question, are the 3d printed versions based on sculpts that were done using more traditional methods by a member here, that was also Buch, is that correct? I think he did a few cast copies and made a limited number of them available for sale. Are the original sculpts what were scanned and made available on shapeways or were they 3D modeled by someone else looking to replicate the design? I knew this information once, but in the time it took me to purchase, build and learn to use both my 3D printer and electroplating equipment, I have forgotten precisely who it is I should be thanking for making such incredible replicas. not sure mate,can't wait to see your finish heads.was thinking about buying a set but they ain't cheap. thresh keller are you on the rpf? YEs, I am also on the RPF. I lurk more than I post, both on here and there. I've had a few accounts over the years due to losing various email addresses, etc. I want to say I've been using both sites for maybe 10 years or more maybe. I love this place so much BTW and rely upon the info I find here to feed my BR obsession. Things here are just on another level. I'm more often than not here rather than the RPF since it caters more specifically to Blade Runner, a film I've had a life long fascination. I do occasionally drift over to the RPF for tips on specific techniques or for info related to various Star Wars builds I have done in the past. I believe I initially had an RPF account as the result of joining the Dented Helmet maybe...from when I scratch built my daughter's scaled down but otherwise accurate kid-sized mando helmet and custom female armor set. She's rocked it twice at NYCC. I have an account over at Mandolorian Mercs stemming from that project as well. In any case, this place has provided me with so much information over the years... and I would like to take a moment in to say thanks to anyone & everyone that has contributed to the site. Your posts have amused, informed and inspired me greatly. Sorry for the lengthy reply. Consider it an introduction of sorts...lol. I'm not at all known for my brevity. So, please... accept my apologies if I've lulled you into a coma with my pointless banter. haha if you search opium duck on the rpf the 3d file you i think you lost is on there.posted by slash-5 if that helps mate. I will definitely grab that .STL if I can find it still hosted on the RPF. Thanks for the heads-up. If I can find the file I'll be sure to print and plate you a Hintha if you want. I'll prob make a few since this will really be my first attempt at chemically weathering something. If you manage to find a direct link or have a copy of the STL you can share please feel free to DM me. It would really help. I'm printing Rick's Optical viewer at this very moment ...and I don't want to jinx it.... but... so far, its going well. GOT IT. THANKS MY DUDE!!! I'LL SEND YOU ONE!!! glad you got it.thanks for the offer but i'm in the uk mate. You make sound like you're on the moon! Lol! Is the postal service not what it used to be in the UK? My cousin lives in London so I've utilized Royal Air Mail on several occasions over the years & have always been quite satisfied. After college I traveled throughout the UK extensively. In any case, if they turn out well, and you want one, I will send it to you. I am certain I can cover the postage. You can let me know when they are done. I ptomice i wont force you to take one. hah! I will most likely put my 2049 Optical Viewer print project on hold for tonight and print the Hinthas so that I can attempt to plate them this weekend. I'll get a different post going of the process maybe if I remember and am not feeling lazy. Stay tuned. haha,you are a gent,thank you very much.can't wait to see your finish work.much appreciated.i will watching for your viewer too. 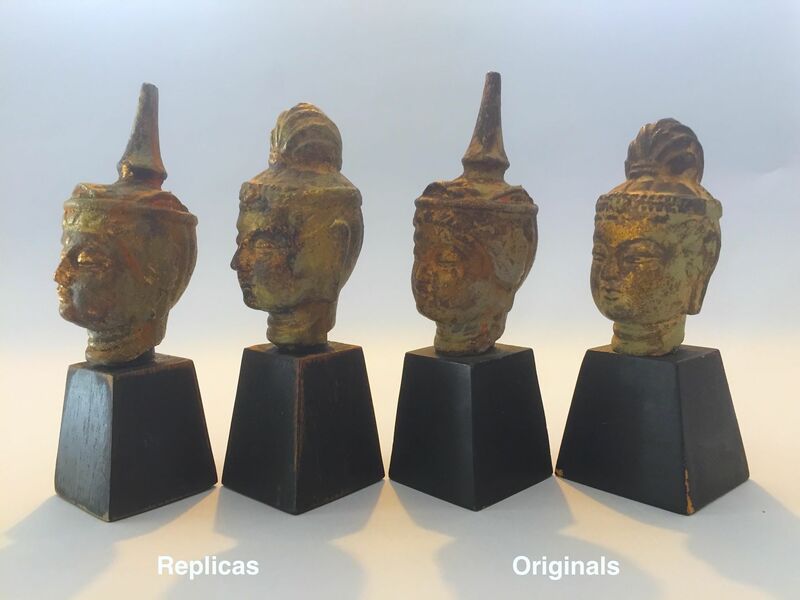 These are the original vintage heads from my collection that the new and awesome 3D files are based on. nice buch,any chance of giving some panting tips please? This is the basic technique that I’ve been using. It’s not at all perfect, but it does give a fairly accurate look. First a cream/sand colored base primer. Then a layer of gold leaf applied with a rough brush to give it a flaked/crackled look. Then a matte lacquer seal (important if you going to use oxidizing metal paints). Then sponge dabs of Modern Master’s bronze and/or iron paint (I love the green patina that comes from the bronze paint). Then Modern Master’s green patina solution, 2-3 applications (leave in cold and moist place to boost effect). Sometimes finished by dry brushing and/or crackle medium with paint in cream/greenish/beige colors on top. You CAN finish with a matte lacquer seal, but it will ruin some of the effect from the oxidizing paint. cheers buch for your tips.